Given its connectivity, low power costs, abundant resources of green energy, natural cooling efficiencies and taxation incentives, the Nordic region presents a formidable argument for the IT deployment plans of any global enterprise. Overseas investments by Google, Apple and Facebook have already strongly impacted the region. And according to BroadGroup Research, an international consultancy that tracks data center, cloud and IT investments, the IT infrastructure market in Iceland, Norway, Sweden, Finland and Denmark is expected to attract an estimated €3.3 billion ($3.69 billion USD), with more than 49 percent coming from overseas internet players, by next year. 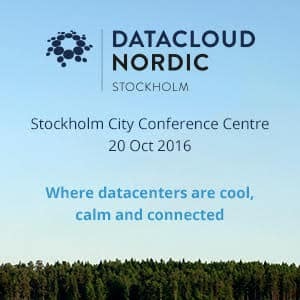 This hot regional forecast sets the stage for BroadGroup’s second annual Datacloud Nordic conference, taking place at the Stockholm City Conference Centre in Stockholm, Sweden, on October 20, 2016. The one-day forum brings together industry leaders, innovators and enterprise executives to address the various energy, scalability, security, architecture and software challenges confronting data center and IT infrastructure management, as well as the industry’s ongoing transition to the cloud.